Pieter de Hooch (Pieter de Hooch and de Hoogh and de Hooghe; December 1629, Rotterdam — 1684 or later, Amsterdam) — painter, genre painter Dutch Golden age master challenging prospects. Features the work of Pieter de Hooch: Along with his contemporaries Gerrit Dou, Gabriel Metsoand Jan Vermeerit played a pioneering role in the promotion of Dutch genre painting in the seventeenth century. Whereas for a long time was more popular than the latter and, as shown by recent studies, influenced the evolution of the style of the "Sphinx of Delft". 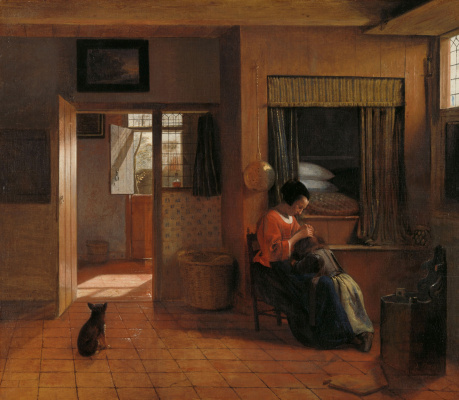 Pieter de Hooch is particularly known as a painter of interiors, complex spatial compositions and atmospheric light. His paintings are at the peak of creativity are distinguished by extraordinary transparency and dialed geometry superbly furnished rooms. 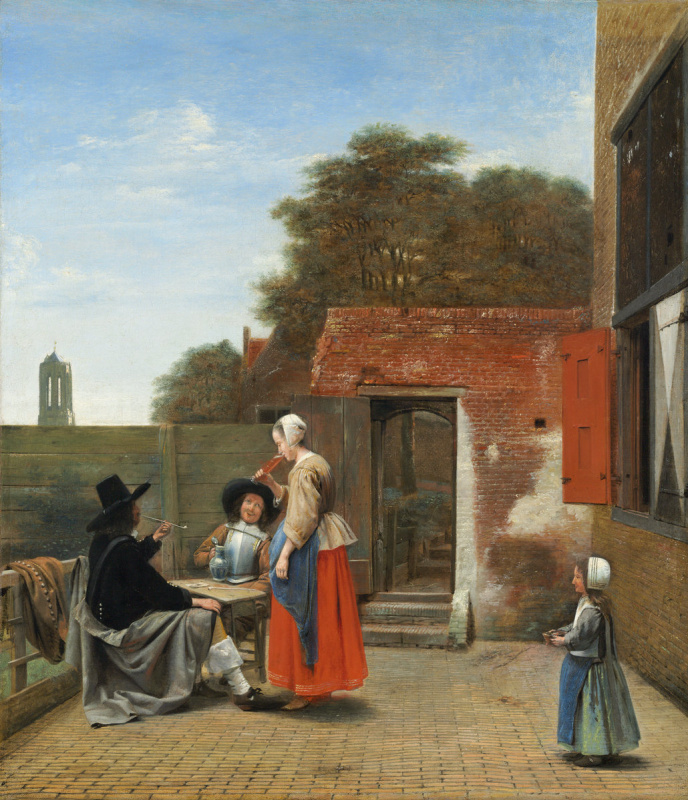 Famous paintings of Pieter de Hooch: "Courtyard in Delft", "The players cards in the sun room", "Maternal duties", "Interior with women at a linen closet". Peter Hendrix de Hooch was baptized in the Reformed Church in Rotterdam on 20 December 1629. His father was a master bricklayer, his mother a midwife. According to records, the future artist was only one teacher, the landscape painter Nicolas Pietersz Berchemfrom Harlem. The exact dates of this student is unknown. And, apparently, the interest of the teacher to the classical ruins and pastoral imagery has had little impact on the student. The first paintings of Pieter de Hooch was the so-called koortegardje — image of noisy soldiers in the stables, the barracks or taverns. The earliest record of Peter de Hooch in Delft refers to 5 August, 1652, when he witnessed the will along with his colleague Hendrik van der Borch. 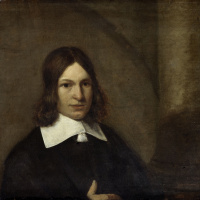 A year later the young man was registered as an artist, as well as dienaar (servant or assistant) of a wealthy cloth merchant Justus de La Grange, a resident of Delft and Leiden. In the inventory of 1655 this merchant was listed eleven paintings by de Hooch. In 1654 the painter married Annette van der Borch from Delft, probably the sister of his friend Hendrik. The couple had seven children. In 1655 Pieter de Hooch joined the Guild of Saint Luke in Delft and paid the fees the next two years. He wrote mostly scenes with merry companies (gezelschappen) and portraits, as well as specialized in the interiors of houses of middle class and the courts, where ordinary people do ordinary things. In Delft de Hooch remained until the end of the decade, but somewhere between mid-1660 and April 1661 he settled in Amsterdam. Apparently, there he lived until the end of his days. It was long believed that 54-year-old master died in 1684-m (this year date from the last picture) in dolhuis, a shelter for the mentally ill. 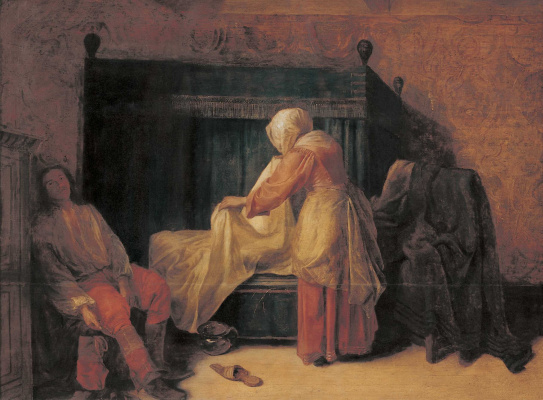 But now it is believed that the deceased there Pieter de Hooch was the son and namesake of the artist. The peak of the career of Pieter de Hooch took place between 1655 and 1662 years. Almost all of his paintings from those years depict a group of people for daily activities or restrained entertainment. The atmosphere of these works is distinguished by the calmness, spaciousness and ease. These effects are achieved thanks to the complex structure of perspectives, the combination of colors and a virtuoso experiments with light. All these are also essential elements of the style of Vermeer, which de Hooch was familiar. By the end of the 1660-ies of the paintings of de Hooch has lost much of its tenderness and delicacy. Later compositions became more monumental and complex, and the colors and lighting effects more severe. And although the painter was not famous pupils, his influence is felt in the works Hendrik van der Borch,Peter Janssens Alinghiand Esaias Borsa. 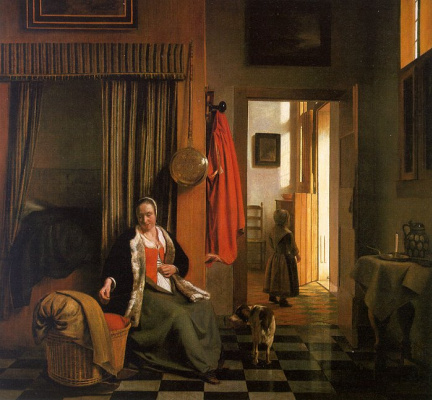 Pieter de Hooch — the acknowledged master of complex perspectives and a stunning play of light. It is small, as a rule, show extremely accurate observation of small details of everyday life. The figures in the paintings — with the exception of the best works of the Delft period, they appear to be angular and more like wooden dolls. On the other hand, their apparent clumsiness gives the scenes a significant share of charm. Technique de Hooch, though highly functional, is still inferior to the skill of other painters of the Delft school — not to mention the Leiden fijnschilders ("fine painters"), who brought the art of oil painting to perfection. But with all the intellectual gaps or technical deficiencies it is the interiors of de Hooch attracted the attention of connoisseurs of the compositions of Vermeer in the twentieth century. Moreover, although the strokes de Hooch often referred to as "dowdy", his style is very visual and memorable at first sight. Homemade stage make up about a third of the entire work of de Hooch. And despite the deeply intimate nature, they do not have the slightest sentimentality or Intrusive moralizing inherent in Dutch genre painting. His narrative, as a rule simple and pay little attention to the moral sermons and iconographic subtleties. The artist sometimes resorts to receive "picture inside picture" to add comments to the main topic. But, according to art historian Jane Turner, "meanings in his work is usually directly related to imaged objects, there is no hidden, coded ideas". Most often de Hooch wrote women and children and was particularly sensitive to the relationship of mothers with daughters. The relationship between Pieter de Hooch and Jan Vermeer was the reason for heated debates among critics. Historians of the nineteenth century believed that the first influenced the second. But now I think that most things were the opposite. In the early works of Vermeer 1650-ies have not seen the big interest in the revolutionary developments of the Dutch genre painters. Only in 1657 he wrote the first known genre scene "Sleeping girl"where did "superficial adaptation" innovative motifs, developed in Delft. "But nothing in this picture suggests the idea that in the end, the author comes to the perfect merging of illusionism and "classical" compositions. 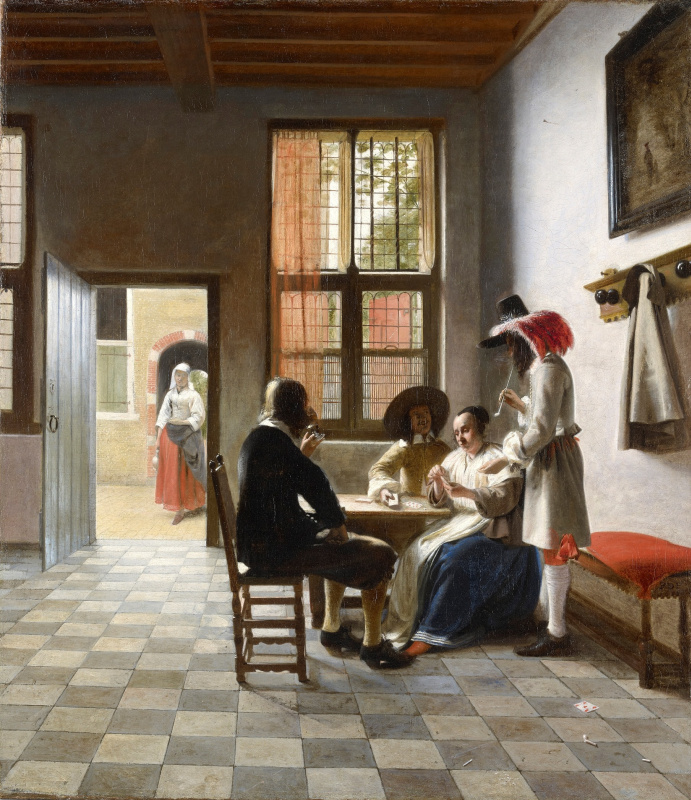 Only an external impetus — works by Pieter de Hooch — prompted Vermeer to this synthesis"— says the expert albert Blankert. However, given the scarcity of historical evidence, it is impossible to say for sure in what cases led Vermeer and de Hooch. There is no doubt that the second was more prolific and versatile artist of the two of them. 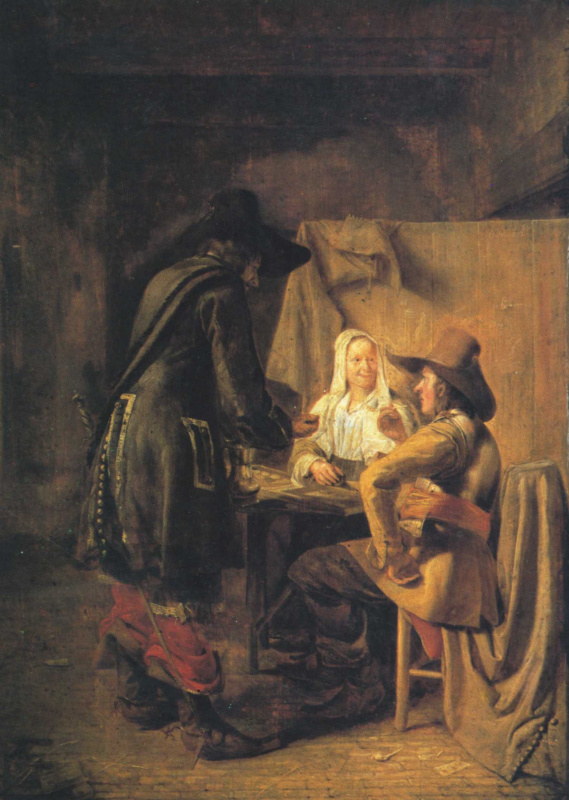 De Hooch explored a number of different lighting schemes, while Vermeer preferred the rays incident from the side, everywhere, except in two late paintings "Lace-maker"and "Guitarist". Unlike his contemporaries, de Hooch used a back-up light not only in interiors but also in the scenes outdoors. Especially delightful is his ability with the utmost precision to capture the reflections of light on ceramics, polished wood and glass. A image of a dimly lit room, where light enters from a window or open door, are not equal. Stylistic tricks in the paintings of Vermeer more or less plausible due to the use of a pinhole camera. 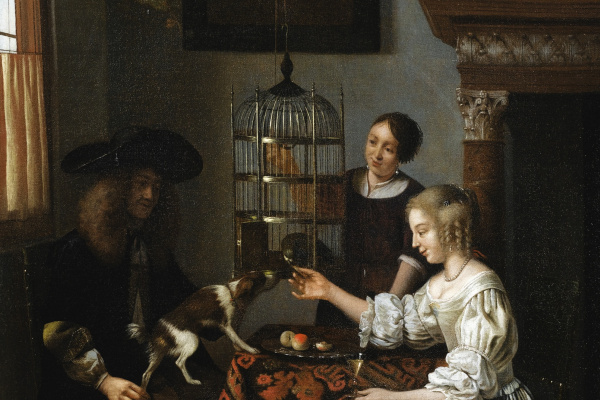 But in the works of de Hooch, nothing hints at the use of optical devices or even interest in them. 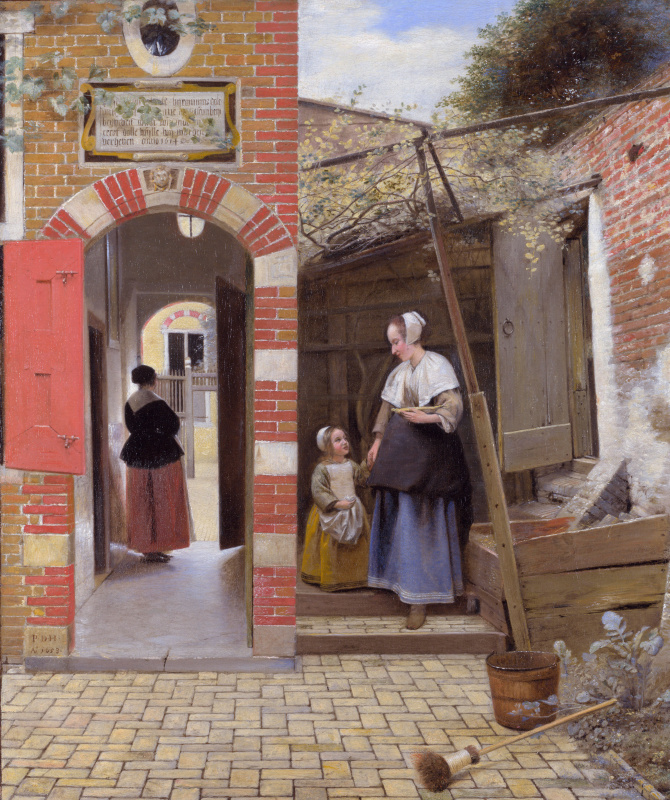 De Hooch is credited with almost the sole invention of one of the most popular motifs of genre painting — scenes in private urban courtyards. "The courtyards were an integral part of Dutch domestic architecture and were equipped or in the middle of the house, or behind it. Buildings in the cities were usually built close to each other on long narrow sections. One of the functions of the yard had to provide lighting inside rooms. 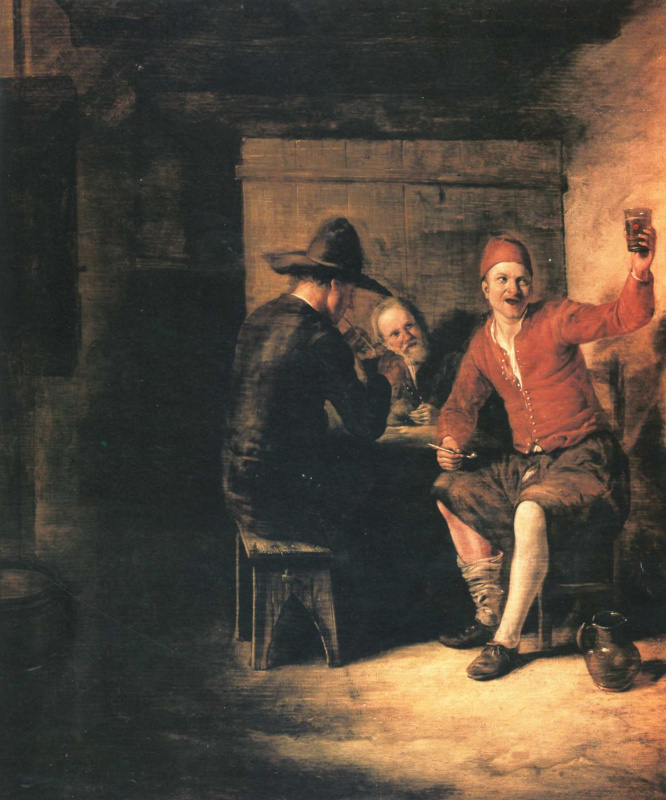 Despite the fact that de Hooch was included in their work is instantly recognizable designs, his paintings are not just saying that in paint real yards. These scenes masterfully combine reality and fiction"writes Wayne Franits from the Getty Museum. Specialization de Hooch was the so-called doorkijkje, or the motif of "through the door" - a double or triple look into the other rooms, courtyards or the street beyond them (1, 2, 3). This allowed the artist to create a more complicated architectural space and at the same time to expand the narrative. Art historian Martha Hollander has estimated that only 12 out of 160 paintings attributed to Dutch, there is no such prospects. Light, perspective and attention to detail in the Mature period of de Hooch creates the illusion that it depicts a real place. Nevertheless, his works are largely a figment of the imagination and the ability to build a composition. "In his paintings you can catch a glimpse of the Delft buildings, including churches Oude Kerk and Nieuwe Kerk, the town Hall and the Old city wall. But the repetition is changed and displaced parts confirms that the paintings contain embedded fragments of these landscapes"— said in 1980 Peter Sutton, the author of the catalogue of the works of de Hooch. 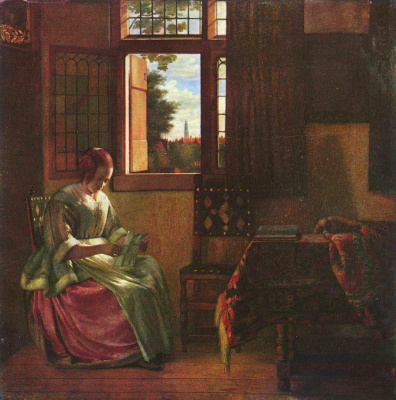 In his era, Jan Vermeer attained a higher professional position than Pieter de Hooch. But in the following centuries the fame of the "Sphinx of Delft" has come to naught, and many of his works are signed once less fortunate colleagues to raise their value. One of the examples is a picture "Artist's workshop"now kept in the Museum of art history in Vienna.